Make it easy to get services to improve mental wellbeing, stop smoking, eat healthily and drink less alcohol. Buzz, Manchester’s new NHS health and wellbeing service, puts health workers at the heart of local communities, connecting people with ways to improve their health and plugging them into the right physical activity with referrals to the Physical Activity Referral Service (PARS). 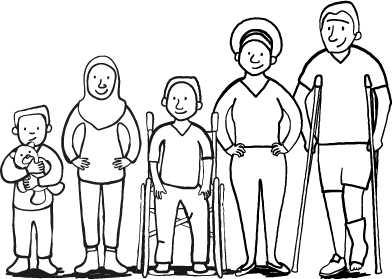 Support carers to look after their own health as well as to care for their loved ones. Carers are a vital, but hidden, part of the health system. 70,000 Greater Manchester carers shoulder more than 50 hours a week of care. Losing just 5% of this would leave 3,500 people needing full care packages from the system. We must identify carers and reduce the pressure they’re under. Support people with long-term conditions such as diabetes or asthma to monitor and manage their own condition. Over 90% of people with long term conditions nationally say they are interested in being more active self managers, and over 75% would feel more confident about self management if they had help from a healthcare professional or peer. Our aim is for all residents to be able to get information and support to improve their health, but there will be tailored information for people with long-term or specific conditions, and one-to- one coaching and education (e.g. support from someone with the same condition), programmes to help them manage their illness, and courses to help them cope with the impact it has on their life. Work with older people so that the city they’ve worked for over the years works for them in later life. They must not feel excluded which leads to a poorer quality of life and more risk of accidental falls and hospital. Organisations must build older people’s needs into all they do, from good seating and green spaces, through housing with extra care when homes are built, good transport, easy-to-get healthcare and networks and social groups that reduce loneliness. The best way for cancer to be identified early is for people to be aware of signs and symptoms that could indicate cancer and to visit the GP as soon as possible. It’s also important to take part in national cancer screening programmes for breast, bowel and cervical cancer when invited or notified that tests are due. Homeless is a complex issue, which can have some serious effects on physical and mental health. For example, the average age of death of a homeless person is just 47. In Manchester health and social care services are determined to play their role in an overall citywide strategy that includes the police and housing partners (The Big Change Manchester – bigchangemcr.co.uk). The move has two main aims: to prevent people becoming homeless wherever possible; and to address the mental, physical and social effects faced by those who are already homeless or are at risk of it. For example, homeless people often find it difficult to register with a GP because they are unable to provide proof of address or ID. This is just one example and we are looking at how that access to GPs can be made easier following the successful work of a GP practice in Ancoats.